Each quarter SWPP surveys the workforce planning community on critical workforce planning topics. 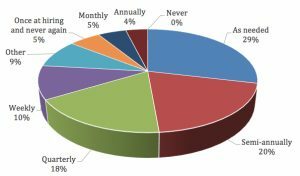 Over 180 call center professionals representing a wide variety of industries participated and provided insight into this quarter’s survey on schedule assignment practices. A similar survey was conducted in 2014 and the comparison is discussed below. Forty-seven percent of the 180+ respondents in this survey work in centers with over 500 agents. The rest are representative of a wide variety of sizes from under 50 up to 500 agents. The financial, heath care, and insurance industries drew the largest number of participants, but all other industries are also well represented. Respondents were asked if they survey their agents to identify their preferred shifts. Slightly over half (52%) indicated that they do conduct such surveys. However, the rest do not. This compares to 50% who indicated they did surveys in 2014, so the practice has only increase by 2%. While it is important not to set up unrealistic expectations, there is value in asking the personnel what they would like for a schedule. Some may want non-traditional shifts that would work well for the center. For example, while 2 days off sequentially is commonly expected to be the preference, there are some agents who want to synchronize their days off with a spouse or others, choosing split days off in some cases. This could work for both the agent and the center. so not much change has taken place over the last 4 years. The respondents were asked how often the schedules are reevaluated and new assignments made. 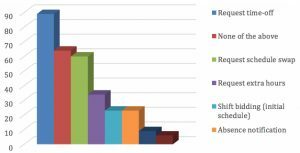 The responses are widely varying with the largest percentage (29%) reassigning “as needed.” Twenty percent indicated that they redo schedules semi-annually, with another 18% doing it quarterly. Only 4% reassign annually while 10% do it weekly. Having a process of “mini-bids” that determine the best schedules to be filled when new hires are added can result in opportunities for more senior agents to improve their shift and ensure the center has the best coverage as well. It may also reduce the need for a wholesale reassignment. This distribution has changed some since 2014 with the respondents then indicating 37% doing it as needed, 16% semi-annually, and 14% quarterly. Respondents were asked which self-scheduling options are available to their agents and they could choose as many as applied. The most common self-service options were requesting time off, followed closely by requests for schedule swaps. Other common options include requesting extra hours, the initial run of the shift bid, requests for schedule changes, and absence notification. This ranking of options has not changed significantly since 2014. Respondents were also asked to identify which of these options are fully automated so that no manual approval or administration is required. Requesting time off was the most common answer with “none of the above” close behind. Each of these automated options reduces the burden on the WFM team in handling the request, but also improves agent satisfaction by giving them more control over their schedules. Once again, the distribution is not significantly different since 2014 with “none of the above” receiving second place after time-off requests. Respondents were asked to identify the value of the self-scheduling options to their agents. Time-off requests received the largest number of “high” rankings at nearly double any other process. 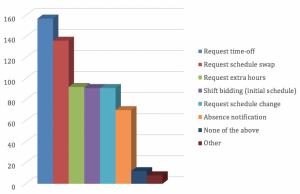 Requests for schedule swaps were also highly ranked with an automated “sick line” close behind. These values are somewhat different from 2014 with the percentage rating “high” for Request Time-Off increasing from 78% to over 84% and Sick Line rising from 28% to 44%. Respondents were asked what restrictions are in place regarding requests for schedule changes and they were able to select as many of the options as applied. 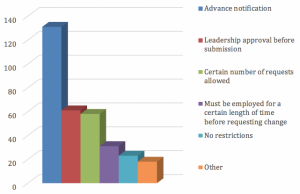 The bulk of the respondents indicated that advance notice is required, while a much lower but significant number require leadership approval prior to submission or limit the number of requests that can be made. Some require the agent be employed for a minimum time and a few have no restrictions in place. It is important to think through the impact of restrictions to ensure that they are reasonable and do not cause an unnecessary burden on either the agents or the rest of the team. Having few restrictions has led to more flexibility and higher agent satisfaction. Demotivation occurs when the supervisor denies a request. There are always agents who will be dissatisfied, but most know that the WFM department is flexible and working to meet their needs without affecting center performance when possible. Very few agents use all their available schedule change requests, so most agents are satisfied. 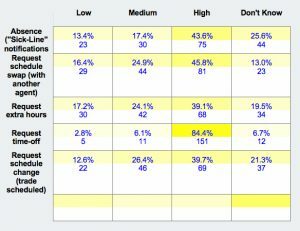 Agent satisfaction is most often impacted when we change/add restrictions on the number of requests allowed. Communication is critical so that agents understand the why of the changes. Agents are frustrated sometimes by not being able to explain their need for an exception. We will still approve changes if a win/win is apparent. Agents tend to be upset when they don’t get approval for their requests, so they find other ways to get the time off. Sometimes agents feel the need for advance notice is frustrating. The overall restrictions help to ensure a fair process in which a few select agents do not get all the benefits. The impact is positive. The process is consistent, and it allows agents to plan better. Based on the responses above, offering agents options in choosing and changing their work hours is important to agent satisfaction. In general, the shifts agents are asked to work ranks second only after fair compensation. Automating those processes can give the personnel more control over their work life, while restrictions such as advance notice and supervisory approval can be seen as limiting factors. Giving agents the ability to make requests through a system that requires little intervention by the WFM team can reduce the administrative burden on the team but could open the door to fluctuating service results if totally unrestricted. While agents may see the restrictions as undesirable, they are necessary to consistent results not only among the agents but for the customers of the center as well. Scheduling in the contact center is one of the more challenging tasks. Finding that delicate balance of meeting the workload with an acceptable and consistent speed of answer with agent satisfaction and resulting retention is not easy. It is clear from this survey that each center finds its own solutions to these challenges and that there is no one right way or industry standard approach that will work for everyone.